Stop and take in your surroundings. Are you seated at your desk with a cup of coffee, pens, and papers splayed about you? Are you outside, reading this post from your mobile phone while a plane flies overhead? What do all of these things — the cup of coffee, pens, and planes have in common? Each of them started as an idea. Could you imagine what our world would look like if the Wright brothers hadn’t dreamt of sailing the skies and then carried their idea through to fruition? Without planes, maybe we wouldn’t have a global economy, or perhaps you’d never have met your significant other. Everything product or business begins with an idea, but that doesn’t mean every idea is good. 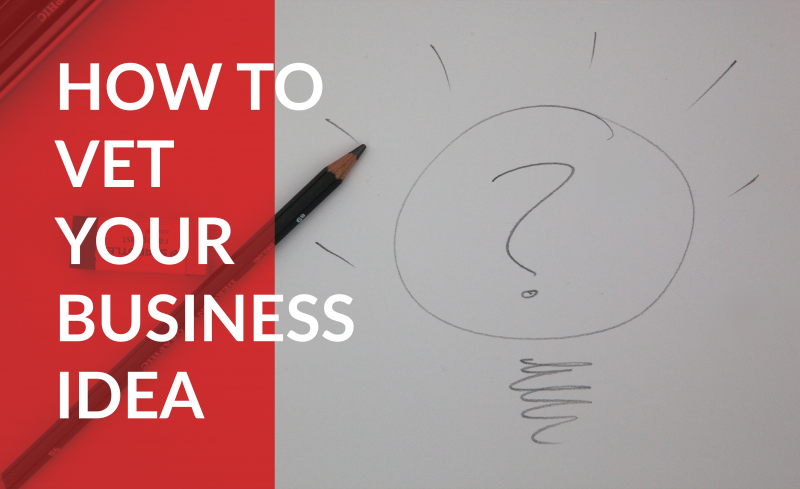 Is the business idea you’ve been tossing around worth pursuing? Is your product idea worth pitching on Shark Tank? If you don’t know, don’t worry. We’re going to take a look at different ways to vet your idea so you’ll understand if it’s time to take it to the next level or if you should steer clear of pursuit. If you’re familiar with the business world then value proposition is a term you’ve heard before. You might think value propositions are the strict purview of business plans, but it doesn’t hurt to think of your value proposition early and often. A value proposition is a statement that clearly and concisely details the unique benefits your idea offers. It needs to convince others that your idea is better than others like it. So how do you determine if your idea has an edge over the others? A good place to start is by researching your competition. You have the power of the internet at your fingertips — take a gander at Google, audit Amazon, and don’t forget Facebook. What makes your idea better than your competitors’ — can you put your finger on it? If you’re having a tough time identifying how your idea outshines the others then ask someone you trust to talk it over. If you find that your idea doesn’t have an advantage over the others, then it’s probably time to set it aside and move on to the next. Nothing flourishes in a vacuum. If you want your idea to succeed then you need to get input on it from other people. Consider asking friends, relatives, coworkers, business advisors, and most importantly, your desired audience. Think about your idea and ask yourself the following questions. What does your ideal customer or client look like? Once you have a better understanding of what they look like, go find those people and get their feedback. If they have concerns, address them. If they have praise, thank them. Take their insights and feedback to heart and make the necessary adjustments to your idea. You’ll have a good sense of your idea’s tenability after talking to others. You’ll come to know if your idea solves a universal, or common, problem, or if it’s unrelatable to most people. If it’s the former, you’re in good shape. Use your findings to improve upon your idea until you find something that resonates, or if it becomes apparent that your idea isn’t well received, consider scrapping it. Ideas are as varied as the people who think them. No one else on this planet has your memories, your experience, or shares your thoughts. This is truly your unique advantage. So what is it that informs you and the way you think? Is your idea born from your years of specialized study and training, or is your background somewhere else? If your experience is in computer science but you’ve been inspired to revolutionize animal husbandry, chances are you’re going to be a little out of your element. Your idea can be good, really good, but you need someone who knows the animal husbandry business to help you fill in the missing pieces that allow your idea to take root and grow. Don’t get defeated if you find yourself at a bit of a loss sometimes, there are people out there with the insight you need and the willingness to help. Consider taking a local class or finding online instruction. So what if you’re not an expert in something right now?— that doesn’t mean it has to stay that way. However, if you’re not willing to put in the time and elbow grease required to learn and grow, you can give that idea a hard pass. One idea can revolutionize the world. Pasteurization, computers, social media — at some point these were mere ideas. Someone, somewhere, took the time to think them through, vet their potential, and bring them to life. Deciding whether or not your idea is worthy of pursuit is possible. Look to identify and explain the value in your idea, open it up for feedback and critiques, and examine yourself — does your expertise and skill set help you or will you have to seek outside counsel or classes? What other criteria or steps have you used to vet your business and product ideas? We’d love to hear about them, so make sure to reply below.